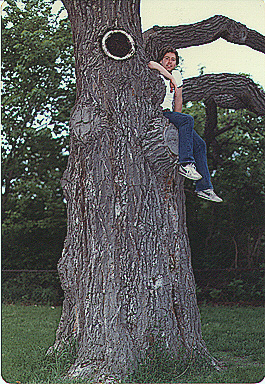 we lived across from the oldest oak in Minneapolis. This was most likely 1981. There was a plaque on a rock nearby announcing that as of 1975 this was the oldest Northern Burr Oak in the city of Minneapolis. Tim's best friend Terry, another member of my high school tennis team, was getting married. So we had the bachelor party for him at our duplex. We made the mistake of buying a keg of strong beer (Schlitz malt liquor Bull) for the event. There were about 15 guys. We drank and watched some dumb movies. Then somebody wanted to play strip poker. I think it was the strong beer talking. I didn't play - seemed kind of "fruity". But most of the guys did. Then, just as some guys got down to their underwear, somebody else suggested we play tackle football in the small park across the street. So we did. With those same guys wearing just underwear. We played until one of Tim's friend broke his collarbone. Then we went back and finished the keg. Above you see me in the oldest oak. I had somebody take my picture after the football game broke up. 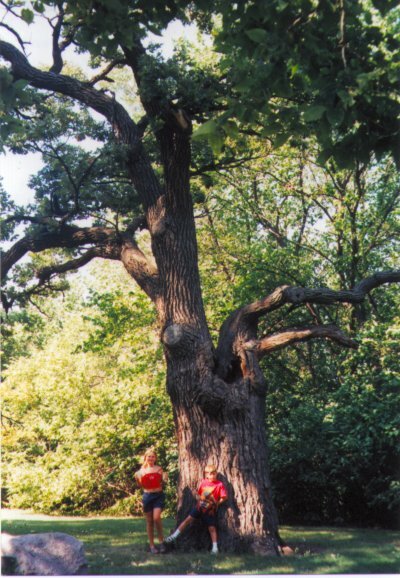 On August 9, 2001 my wife and two of my kids and I visited the oldest oak, which is still standing. Here they are in front of it.